KAOS Fm is listener-supported and depends on the contributions of donors and volunteers. KAOS is not just for Evergreen students — it’s open to the entire community. 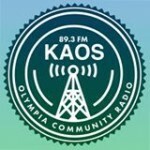 Kaos Fm stimulates music from fresh artists, small document companies, and material that receives little airplay in us. Kaos Fm is focused on ensuring that no less than 80% of the particular music played around the station comes by independent record name and distributors. KAOS has maintained this music policy since 1978, and their policy has served as a model of other radio stations. KAOS is a non-commercial, community radio station, located in Olympia, Washington, serving and broadcasting to the South Sound area. The station broadcasts at 89.3 FM at 1100 watts, 18-24 hours a day, 365 days of the year. Its coverage area includes Olympia/Lacey/Tumwater, Thurston County, Shelton, Mason County and portions of Lewis, Pierce and Kitsap Counties. KAOS programming includes a wide range of music, women’s issues, Native American, Spanish language, comedy, Democracy Now!, local, national and international public affairs, call-in discussion and more. KAOS is licensed to The Evergreen State College, Washington’s innovative four-year college, nationally acclaimed for its interdisciplinary studies in the liberal arts and sciences.